We have some of the most stunning scenery on this glorious island. Our towns and villages are second to none. And as people, Salopians just cannot be bettered. And then there’s our business community. Day after day, week after week, the work which goes on in the thousands of businesses across this county establishes the wealth and prosperity from which we all benefit. And the very great majority of it is unsung and unheralded. You simply don’t see the legions of men and women who lead our businesses shouting from the rooftops about how great they are. They just get on and do it. 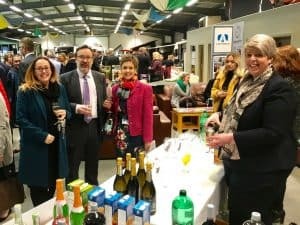 Which is why it was such a pleasure to be at the launch of the Shropshire Chamber’s Shropshire Business Awards in Shrewsbury the other night. (Alright, the free food and fizz helped a little as well). Here is our chance to heap some much-deserved praise on the businesses which do the most to make this county stand out as such a great place to live and work. From small one-man bands to the major international brands which do their thing here, there are 17 separate awards to recognise excellence in whatever shape or form it takes. The awards are open to all companies with an SY or TF postcode and are absolutely free to enter. And you can even enter multiple categories if you think you meet the criteria to boost your chances of success. And naturally, there’s a super swanky awards bash – this year on June 14 at the Telford International Centre – to get dressed up for. It’s a great excuse to let your hair down and celebrate a part of county life which doesn’t always get the credit it deserves. So if you work at a company which is doing great things each and every day of the working week, make sure you are badgering your boss to get an entry in.